In this rebuttal we’ll poke holes in the notion that truck and gun are interchangeable. 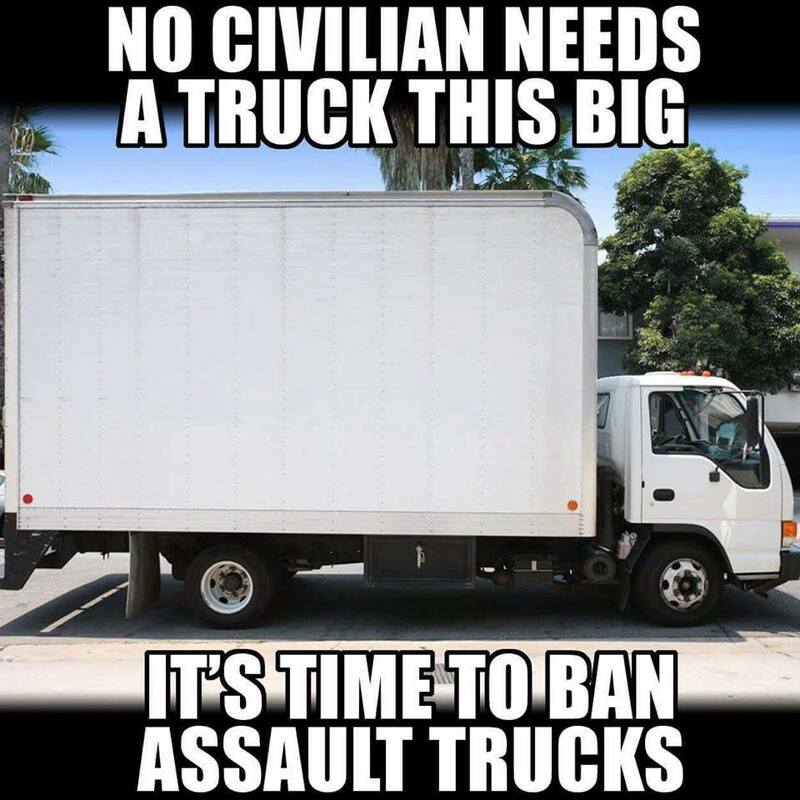 The tragedy in Nice, where a truck was used, is not at all relevant to the discussion of gun control in America, specifically calls for semi-automatic weapons to be less available to the general citizenry. One, what is the basic function of a truck? A truck’s primary use is to haul goods and materials. A car transports people to and from work, school and activities. Their primary functions are utilitarian in nature and while accidents happen and they can be used for violence, how many times has a truck been used vs. a gun to kill people? Even in self protection or hunting, a gun’s primary function is a violent one; either to intimidate, kill or significantly wound the target. And yet you compare a gun to truck? Bad analogy. Two, most industrialized nations require license, registration and training to operate and own a truck or a car. Yet, here in America, suggestions to require similar measures for gun ownership are met with frothing at the mouth. So, if you want to stick with this analogy, I’d be happy to try it. Let’s register all the guns in American and require training and licensure to carry one. Three, it’s true, cars and trucks are used as vehicles of mass destruction and for nefarious purposes. Yet we cannot outlaw cars and trucks due to their overwhelmingly positive and utilitarian uses. However, we have adjusted. We installed barricades at would-be targets such as transportation hubs and government buildings making cars/trucks without clearance much less likely to be able to get closer. But, what makes the truck so dangerous, is the chemicals inside it. And there we have faced similar resistance to reasonable restrictions to access of guns, this time with ammonium nitrate. It ‘only’ took 12 years after the Oklahoma City bombing to get some kind of legislation on the books regulating its sale. How many more years until we get a handle on our gun violence? How many more cities will we add to the list? There are many issues behind the motivation of violence; government interventions, colonialism, racism, corruption, mental illness, disparity of wealth and religious extremism. These are hard to solve. But, simple measures limiting access to weapons or materials remain the most effective way to lesson the damage. And still there’s resistance. I’d prefer meaningful solutions to bad analogies. This entry was posted on July 17, 2016 by A.J. Simonsen in Meme Rebuttal and tagged ammonium nitrate, car bomb, gun control, guns, Nice, Oklahoma City, registration, truck.